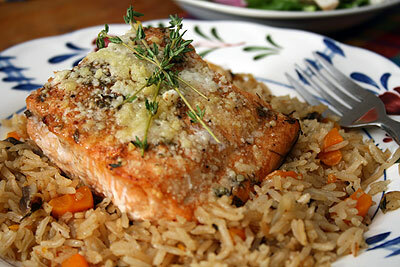 Tonight we’re eating baked salmon marinated with lemon and thyme garnished with pecorino romano and thyme sprigs, served over basmati rice, pilafed with mushrooms, carrots, onions, and fresh herbs. T: yeah so we really don’t eat fish too much. mmmm this salmon sure was good… ooh it makes me want fish. A: total ditto to that, dude. This made me want to buy more fish. I just wish we could get decent fish at a decent price in Baton Rouge. T: Where did you get this fish, Amanda? A: I got this fish at a wretchedly unmentionable store. T: why would you go to a wretchedly unmentionable store? A: because they’re cheap. Fortunately today they had a decent salmon piece on display. T: it certainly was decent. To say the least…. how were the lines at this store today? A: unbelievable. Actually, I know you’ve experienced them to this level in the past seven days so I guess it is believable. A: no joke. makes me never want to go to the store, and I love grocery shopping. T: Oh yeah, and that rice went really well with the fish. They were seamless. A: welp, what’d you give them, there, big man? T: I gave the meal a 9.489. A: wow, that is really close to a 9.5, but it just didn’t make it, huh? T: nope, not quite 9.5 material. I just kidding. A: oh, it’s quite alright, I agree it’s not 9.5 material. But it is damn good. I give it an 8.9. It was awesome. But the consistency of this fish isn’t what it could have been if I’d been able to find better fish. T: It was a healthy meal, too. A: yeah, we had a salad with it, although it’s not pictured. So we did get a well-balanced meal.